SteveTheShadow wrote: Will you both be leaning on lamposts? Not until we've finished cleaning windows. And playing peter gunn on our beths bass guitar, and having a mandolin in the house when i was a kid. Wonder what happened to that? Ha! Nice one our-Ant! We've got him bang t'rights! 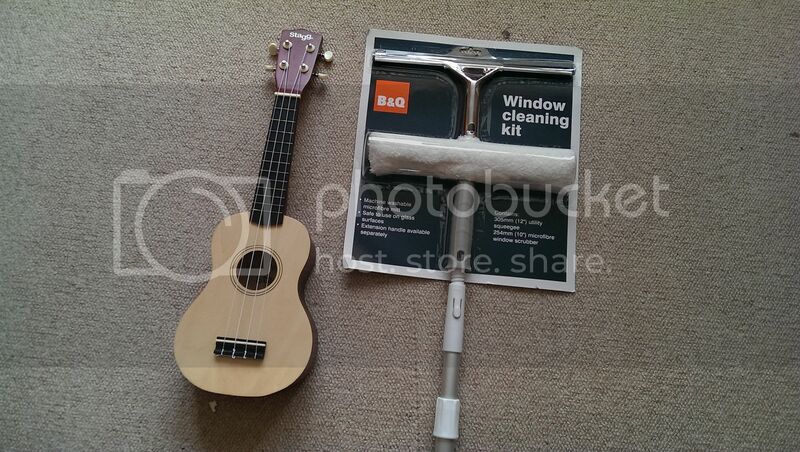 Last part of my George Formby tribute act arrived today. Dave the bass wrote: Last part of my George Formby tribute act arrived today. Aha! Having popped round to Bass Towers, including the exquisite shed extension, I was subjected to a quick blast on this! I think it needs to come to Owston…..
Was that some sort of shed-warming party ? It looks to be coming on very nicely….Its even got skylights…. "Have you ever felt the ribbing, on your Grandmas ol' Glass washboard (Matron)"
My personal Ukulele prowess has facilitated the need to 'up-ones-game' and actually buy one that has the frets in the right place thus giving me a fighting chance to play stuff 'in tune'. Well hello you lovely aged Cedar solid-top beauty purchased from London's Hippest Uke showroom in the Hippest part of swinging Lundun town, phwoooaaaarrrr! I'll challenge you to a duet with my violin if you're not careful…..
Greg wrote: Dualling strings eh?